Abstract: Delayed diagnosis of autism spectrum disorder (ASD) into adulthood is common, and self-diagnosis is a growing phenomenon. This mixed methods study aimed to explore barriers to formal diagnosis of ASD in adults. 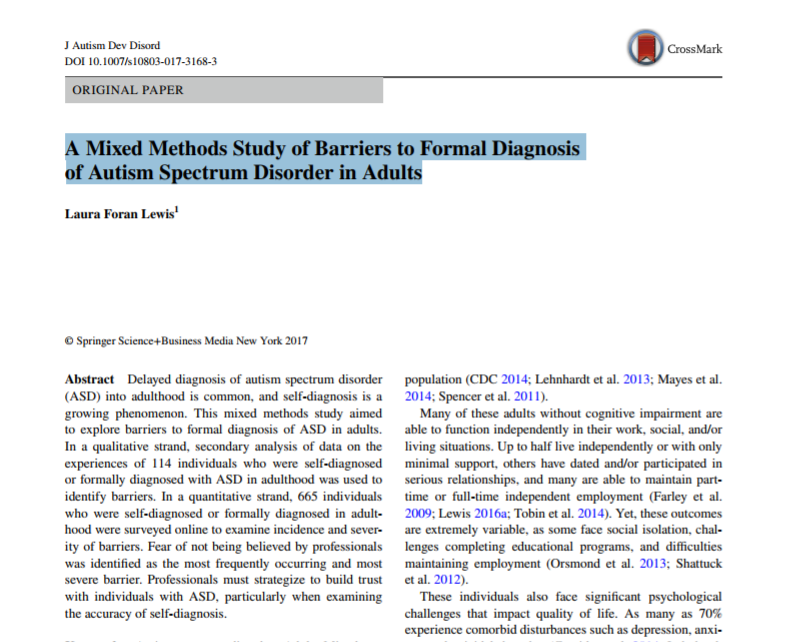 In a qualitative strand, secondary analysis of data on the experiences of 114 individuals who were self-diagnosed or formally diagnosed with ASD in adulthood was used to identify barriers. In a quantitative strand, 665 individuals who were self diagnosed or formally diagnosed in adulthood were surveyed online to examine incidence and severity of barriers. Fear of not being believed by professionals was identified as the most frequently occurring and most severe barrier. Professionals must strategize to build trust with individuals with ASD, particularly when examining the accuracy of self-diagnosis.